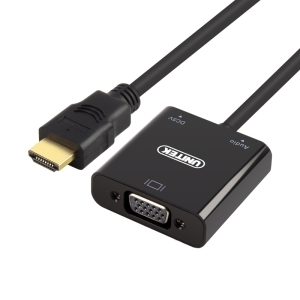 Y-6333 is a high performance converter which converts the signal from HDMI interface to VGA interface. With HDMI1.4b standard, it supports up to 1080P resolution. This product has an additional Micro USB port. Some devices or monitors require higher power to process the conversion. Just connect an external power supply to Micro USB port, it enhances the signal and performance.